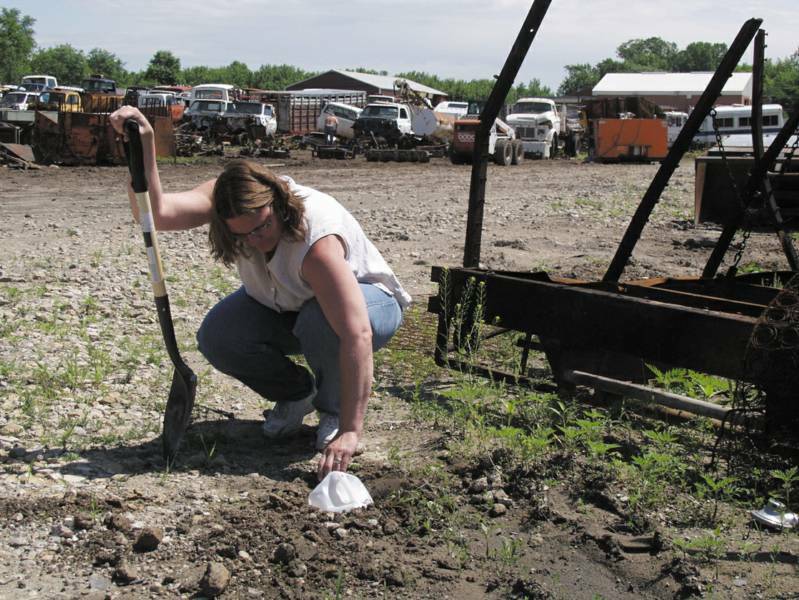 Iowa auto salvage yards with more than 250 vehicles in the yard are required to sample storm water (rain) runoff for parameters listed below. Collect and submit rainfall samples to a laboratory for analysis annually. Retain a copy of the report with the Storm water Pollution Prevention Plan (SWPPP). It is not required to submit the report to the DNR but it must be maintained on-site in the event an inspector requests to see it. There are no regulatory limits on the values of test results, only that the samples are taken and analyzed. An analytical laboratory with the capacity to test storm water may conduct the testing procedures. An arrangement has been made with TestAmerica to conduct the samples through Sue Schauls that will ensure accuracy in the testing procedures using the parameters required and reporting data accurately. DOWNLOAD the INSTRUCTION and a CHAIN-OF-CUSTODY Form - This is a fillable PDF that will identify your sample at the laboratory and ensure proper testing parameters and threshold levels for testing. PLEASE put the name of the facility on the form! Collect a representative grab sample and a composite sample of rain water flowing off the property (outfall location). NEW > You must take a field pH sample using the pH strips included in the sample kit. Take the strip out of the container and put storm water in the container then dip a strip. RECORD the value corresponding to the color of the strip as indicated on the bottle, 7.0 is neutral (the desired value) on the Chain-of-Custody form. STEP ONE: In the first hour of a rainfall of significance (about 2 inches) using the storm water kit (cooler) received from TestAmerica, collect water in a clean cup and fill the bottles marked “composite” 1/3 full then fill all the bottles marked “grab” completely full. STEP THREE: Wait 15 more minutes and fill the bottles the rest of the way full. sample was taken. Sign the form and place it in a plastic baggie in the cooler. A separate bag is included for ICE! FALLS, IA using the included shipping label and prefilled CHAIN OF CUSTODY. In about two weeks you will receive a laboratory report and a data interpretation from Sue. 1) A grab sample is a one-time sample that represents the discharge in the beginning of the rainfall event. The grab sample must be taken in the first hour of the discharge. The laboratory recommends taking a 3000 milliliters (ml) sample (about two quarts) to ensure enough water to perform all tests is available. 2) A time-weighted composite sample is taken at timed intervals in equal amounts. The composite sample is taken as a combination of (at least three) small samples (called aliquots) taken throughout the duration of the discharge (for at least three hours), with each small sample being separated by at least 15 minutes. 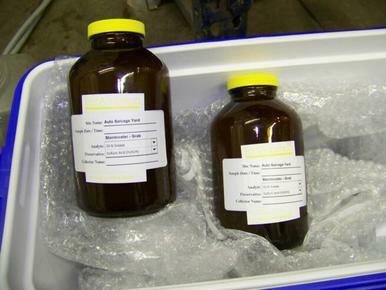 The laboratory recommends taking 300-1000 ml at each sample so that the total amount of the composite sample is 3000 ml (about two quarts) to ensure enough water to perform all tests is available. Automotive salvage yards have particular concerns for adding pollutant to storm water runoff due to the sheer number of vehicles present in a yard at any given time. Effective pollution prevention of these storm water pollutants is accomplished through choosing the most applicable Best Management Practice (BMP) as identified in the Storm Water Pollution Prevention Plan (SWPPP) developed as part of the storm water permit requirements. 1) Complete a Notice of Intent (NOI) to discharge storm water. Iowa DNR Form 542-1415. 2) Run a public notice in two widely distributed local newspapers. 3) Prepare and maintain a Storm Water Pollution Prevention Plan (SWPPP). 4) Pay the applicable fee to the Iowa DNR. $300 per salvage yard for a three-year permit. 5) Begin annual inspection of the facility and provide training to employees. 6) Annually monitor the storm water runoff by collecting samples for laboratory analysis.